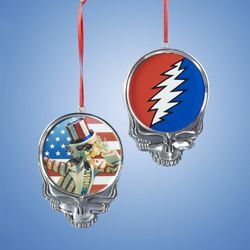 This Grateful Dead skull ornament comes in 2 different designs. Available in the SYF design with the 13 point lightning bolt, or with the Uncle Sam design in the center. This ornament measures approximately 3 1/2" big. Officially licensed Grateful Dead merchandise.